From November 16-21, Words, Beats and Life is presenting Remixing the Art of Social Change, an ambitious hip-hop teach-in with an international approach. Folks from around the world are coming together in various venues in Washington, DC to participate in a unique experience that’s both action-oriented and community-based. 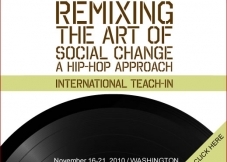 The teach-in will focus on the tools and resources necessary to develop curriculum, programs and artistic and scholarly work based on hip-hop culture.